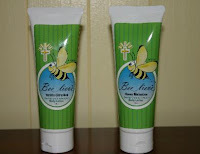 Easter is coming up this Sunday and a good product to put in your Easter basket is the Bee Lieve lotion. Bee Lieve products were made to inspire people by the healing affects of honey and aloe vera and also by including a Bible verse on the package. I thought this was a great idea and I tried the Honey Melonbee lotion. It is made for your whole body, but I recommend it only for your hands and other dry spots of your body. The lotion has a sweet smell and it is not overpowering. The lotion moisturizes really well and it makes my hands feel very soft. It was a bit greasy at first, but after a few minutes it soaked in. The lotion costs around nine dollars, so check out their site and you can look for places in your area that sell Bee Lieve products or purchase them online. Enjoy! Thanks for this tip! I will try some of the lotions. Also could you please visit my blog because there is a post there and at the bottom of it I talk about a easy way to help the world. Such as breast cancer, hunger, animals, rain forests, and reading. All you have to do is click a the links once a day and it donates money to all these charities! Thanks so much!